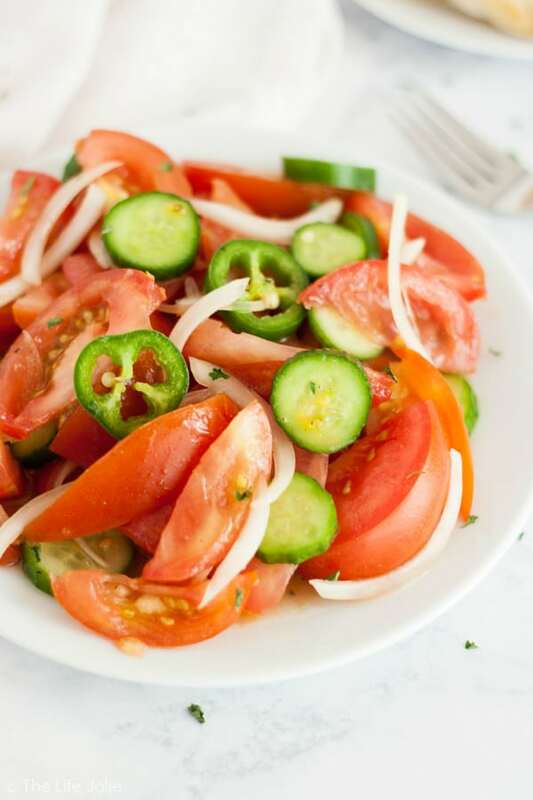 This cucumber tomato salad is perfectly versatile side for everything from casseroles to BBQ. 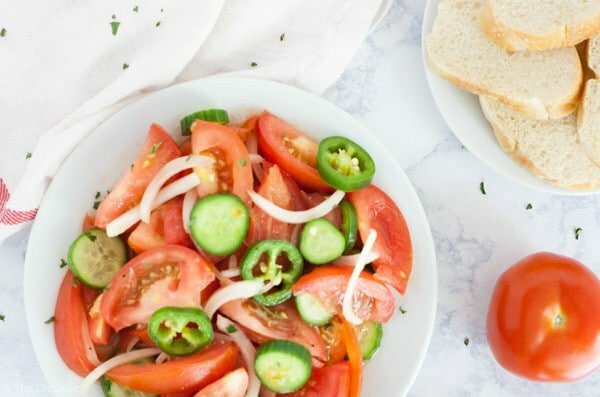 Refreshing and delicious, this zesty (and slightly spicy) tomato salad is a bite of summer all year long. I’m all about simple dishes where the sum is more than the parts. 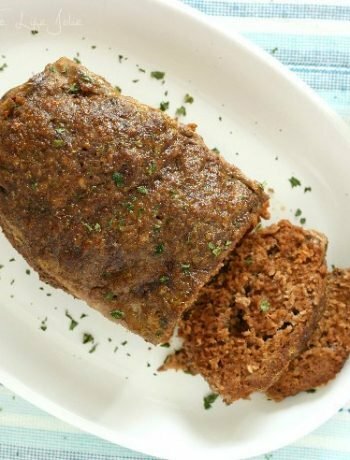 You may look at the recipe and say “but this is too simple, there are no fresh herbs, just a few basic ingredients.” And that, my friends is where the magic of this dish come in. 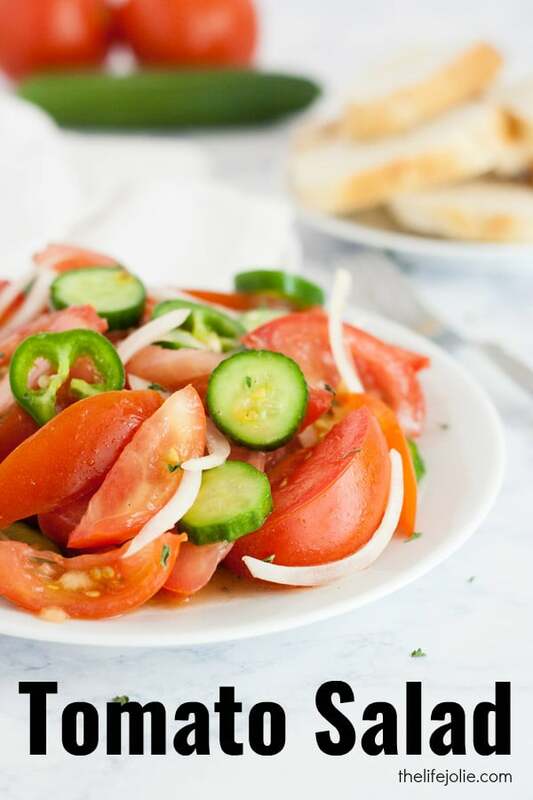 In this tomato salad recipe, the tomatoes are front and center, specifically the juice which are the true star of the show. A combination of aromatic and acidic ingredients that make it perfect to serve with a nice, fresh loaf of Italian bread to sop up all of that incredible juice. 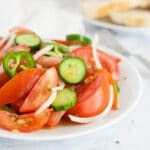 Flexible enough to serve with all types of global cuisine or down home cooking, the tang of the red wine vinegar, the flavor of the onions and the kick from the jalapeños really brings this salad over the top. Make this at least a few hours ahead or the night before serving it so that the flavors really have time to meld together. I periodically go back to the bowl and push down with a spoon on top of the salad to squeeze out more of the juices, just like Grandma did. This is actually a dish that tastes even better a few days later. You can add more tomatoes to the juice after a day or two to reinvigorate the salad and not waste a drop. Jalapeños are optional, if spicy is not your thing. Although not traditional (Grandma would say no to this! ), you can even swap feta and olives for the jalapeños to make it Greek or balsamic vinegar for the red wine vinegar, this dish works with lots of entrees! Will this tomato salad recipe keep in the fridge? Yes! This is actually a dish that tastes better when a few days have passed for the flavors have come together more. Which tomato is best for this salad? I made this with homegrown, which made the labor of love even more worth it. But any ripe tomato will do – heirloom, off the vine, or even cherry! How do you serve this tomato salad? This side dish works alongside too many entrees to list! But, I also love it as a meal starter, served with crusty Italian bread. How cut tomato salad? I like to cut the tomatoes into wedges, slice the onions super thin, slice the cucumber (Grandma always peeled the, but I’m too lazy!) and slice the jalapeños. Can you freeze salad tomato? I’m wouldn’t recommend it- tomatoes and cucumbers have a lot of liquid in them and the texture won’t hold up. 1-2 jalapeños, if you don't like spicy foods, feel free to remove the seeds or even leave them out. one jalapeno is usually my go-to. Two makes it really spicy! 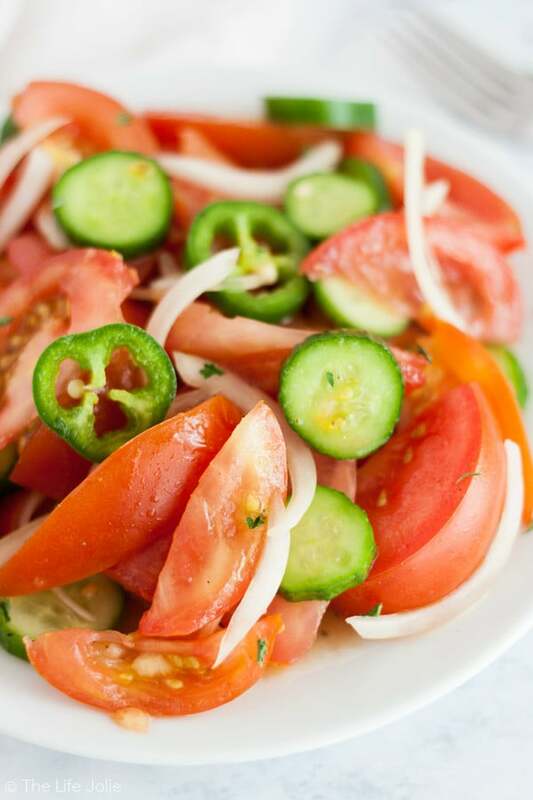 Combine the tomatoes, onions, cucumbers and jalapeños in a large bowl. Season with salt and pepper to taste and dress lightly with oil and vinegar. Use a light hand with the oil and vinegar (remember, the idea is for the juice to be the center of the dressing, not the vinegar!). Cover and refrigerate for at least an hour, periodically using a large spoon to lightly press down and squeeze more juice out. Serve with plenty of crusty Italian bread to sop up the juice!